1. Chill coconut milk in the refrigerator for several hours or overnight. To prepare, remove can from the refrigerator without shaking or turning and remove the lid. Scoop out the solidified “cream” from the top of the can and transfer to a mixing bowl. Reserve remaining liquid coconut milk to use in the smoothie. 2. Add maple syrup and orange zest, if desired, to mixing bowl and blend until light and airy. 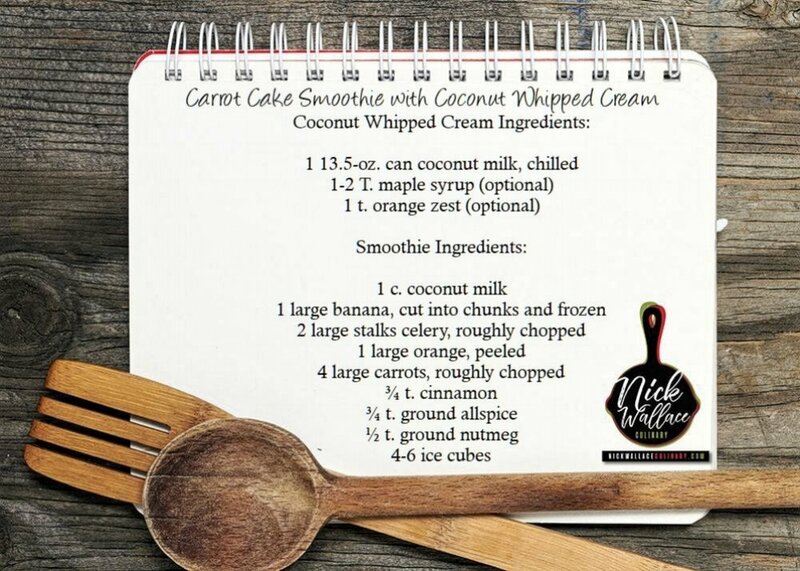 Allow coconut cream to warm up slightly before blending if lumps persist. Cover and place bowl in refrigerator until ready to use. 3. Add the coconut milk and frozen banana to a high-speed blender and blend until smooth, around 30 seconds. 4. Add celery, orange, carrots, cinnamon, allspice, nutmeg, and ice cubes. Blend on high speed until completely combined and creamy, approximately 1-2 minutes. 5. Pour into glasses and top with a scoop of coconut whipped cream. Garnish with a dash of cinnamon or finely chopped walnuts, if desired, and serve immediately. Enjoy!